Avalon Light Photoart was founded in October 2009, by Richard Winn. Richard is a part time photographer, based in Somerset, in the south west of England, not far from the large city of Bristol and close to the opportunities of the Somerset Levels and uplands, such as Exmoor and the Quantock Hills. Early on, I recognised that setting up a website from scratch was very time consuming, so I decided to use Photoshelter and their tailored templates, designed with photographers in mind. This also took the risk out of running an e-commerce website, with any security being handled by people who know how to protect customers. I am based in Bridgwater and my full contact details can be found on the Contact page on the main website (http://ps.avalonlightphotoart.co.uk). I specialise in nature photography, but this covers a wide range of subjects. Choice of wildlife subjects range from macro photographs of tiny insects, through to large mammals such as red deer and bottlenose dolphins. I also specialise in micro landscapes and natural textures and abstracts, not to mention wide open landscapes. A number of photographs are now available, from my local area of Somerset and Devon and from the Scottish Highlands, where I often feel more at home. Also, being based in Bridgwater makes me ideally placed to document the annual Bridgwater Guy Fawkes Carnival, probably the largest illuminated carnival in the world. In the Spring of 2011, I published a book titled “A Journey with Nature”, based on my experiences while exploring the natural world. This was self-published through Blurb in two different formats; one containing text only in a pocket format and one in a larger format, illustrated with photographs relating to the text. It is now also available in electronic form from Amazon’s Kindle site. I have found that social media has offered me little benefit so far, but I do have a Facebook fan site. Recent news can be found there, on my personal Facebook page and on my blog, where I also have some photography articles. Hopefully, these outlets will offer not only portals to expand my business in the future, but also a conduit to express my vision. I feel that to progress in any art form, you have to experiment. It is only by experimentation that you explore new ideas and develop your own identity. This is no different for photographers, particularly those who aim for a more artistic style. I am always striving for something a little different, I don’t always succeed of course, but each time I experiment, it makes the chances of being different more likely and strengthens my individual style. The featured picture came about as a result of this experimentation. I’d wanted to experiment with narrow depth of field, using selective focusing for around 12-18 months and had practiced with some larger subjects, but it was a while before I found a suitable subject in a situation where photography was possible last autumn. The subject itself was a small juvenile of the common toad (Bufo bufo), less than two inches or five centimetres long. I tried a couple of side on compositions, before moving to the front, with slightly more depth of field. 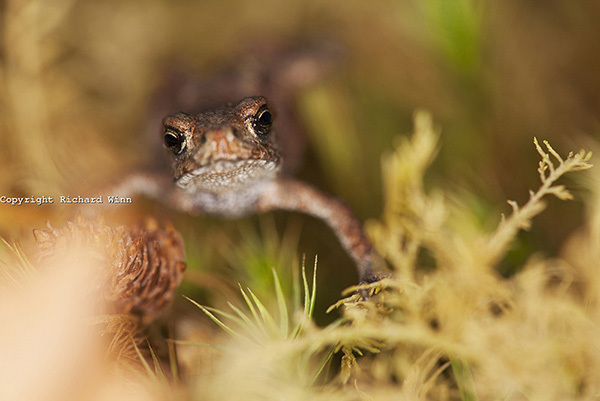 I then concentrated on focusing on the two prominent eyes, throwing the background and rest of the toad out of focus. The in focus bits of moss then helped to frame the subject, with the colours from the rest of the moss giving a nice smooth, colourful background. I have set this as a limited edition print, priced at £34.99 for an unmounted A3 print on Fine Art Pearl, but it is also available mounted and as a matt print at additional cost. It can be found in the Reptiles and Amphibians gallery. This entry was posted on Wednesday, February 14th, 2018 at 8:41 am. It is filed under Featured photographer, Members, New Images, Stories, TUMBNAIL SLIDER and tagged with action, adventure, animals, fine art, landscape, nature, stock. You can follow any responses to this entry through the RSS 2.0 feed.